The Hero Street Monument Commmitee P.O. Box 124 Silvils, IL 61282 309-755-8002 herostreetusa@hotmail.com June 7, 2001 Mr. Raymond Rangel President League of United Latin American Citizens (LULAC Council # 10) 4224 Ricker Hill Road P.O. 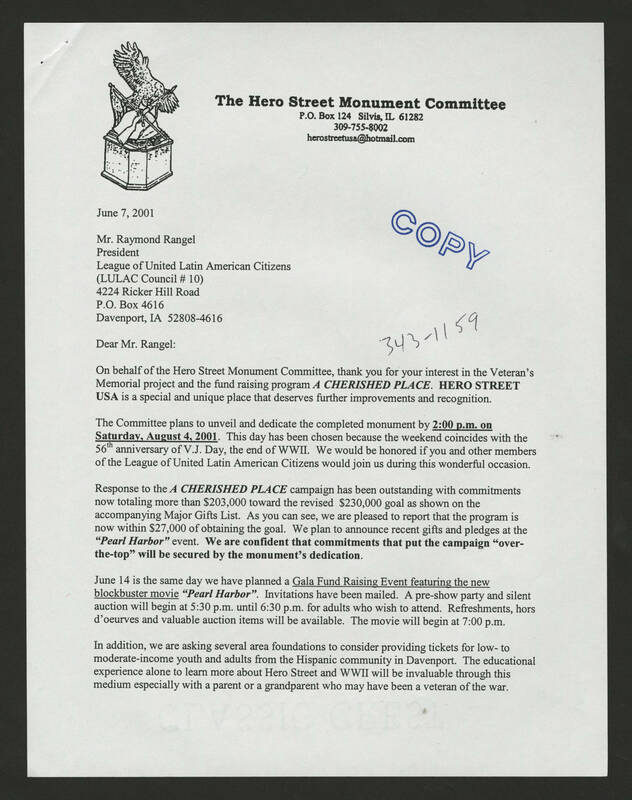 Box 4616 Davenport, IA 52808-4616 Dear Mr. Rangel: On behalf of the Hero Street Monument Committee, thank you for your interest in the Veteran’s Memorial project and the fund raising program A CHERISHED PLACE. HERO STREET USA is a special and unique place that deserves further improvements and recognition. The committee plans to unveil and dedicate the completed monument by 2:00 p.m. on Saturday, August 4, 2001. This day has been chosen because the weekend coincides with the 56th anniversary of V.J. Day, the end of WWII. We would be honored if you and other members of the League of United Latin American Citizens would join us during this wonderful occasion. Response to the A CHERISHED PLACE campaign has been outstanding with commitments now totaling more than $203,000 toward the revised $230,000 goal as shown on the accompanying Major Gifts List. As you can see, we are pleased to report that the program is now within $27,000 of obtaining the goal. We plan to announce recent gifts and pledges at the “Pearl Harbor” event. We are confident that commitments that put the campaign “over-the-top” will be secured by the monument’s dedication. June 14 is the same day we have planned a Gala Fund Raising Event featuring the new blockbuster movie “pearl Harbor”. Invitations have been mailed. A pre-show party and silent auction will begin at 5:30 p.m. until 6:30 p.m. for adults who with to attend. Refreshments, horsd’ oeurves and valuable action items will be available. The movie will begin at 7:00 p.m. In addition, we are asking several area foundations to consider providing tickets for low-to-moderate-income youth and adults from the Hispanic community in Davenport. The educational experience alone to learn more about Hero Street and WWII will be invaluable through this medium especially with a parent or grandparent who may have been a veteran of the war.